Thank you for your trust in our company and for buying the new Energy Tower 2 Style. We hope you enjoy it. This sound tower with 25 W power has been created to satisfy all musical needs that users might have at home. It features Bluetooth 4.1 technology, FM radio, MP3 player for removable storage units (USB sticks and microSD cards) as well as a 3.5 mm audio-in. Do not expose your Energy Tower 2 Style to impacts, dust, humidity or high temperatures. 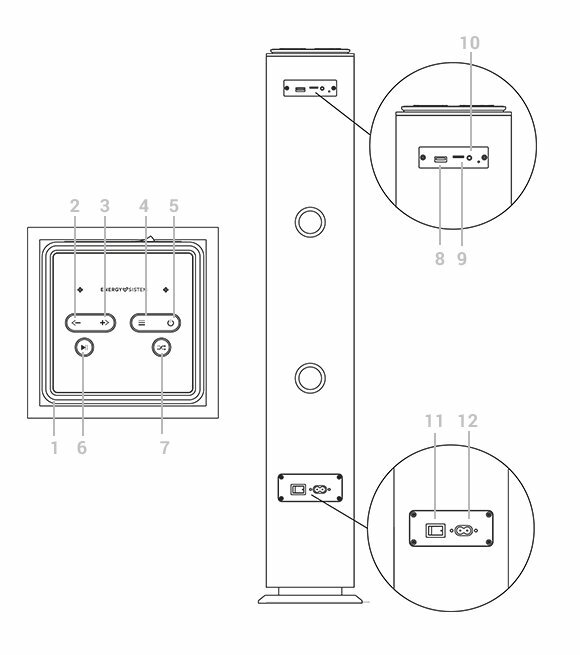 Once the power cable has been connected to the back of your Energy Tower 2 Style (12), connect the plug to the socket and move the power switch (11) to the ON position. From that moment on, you just have to press and hold the On/ Off button (5) on the top panel for 2 seconds to switch on or off the tower. Press the Playback mode button (4) to choose one of the different playback modes available: Bluetooth, USB, microSD, FM and auxiliary input. The LED indicator (1) shows the selected mode: blue for Bluetooth, orange for MP3 playback via removable USB sticks/microSD cards or auxiliary analogue input and green for FM radio. Press Volume -/ Back (2) and Volume +/ Next (3) to adjust volume (press the button once) and switch to the previous/next track (press and hold the button for 2 s). 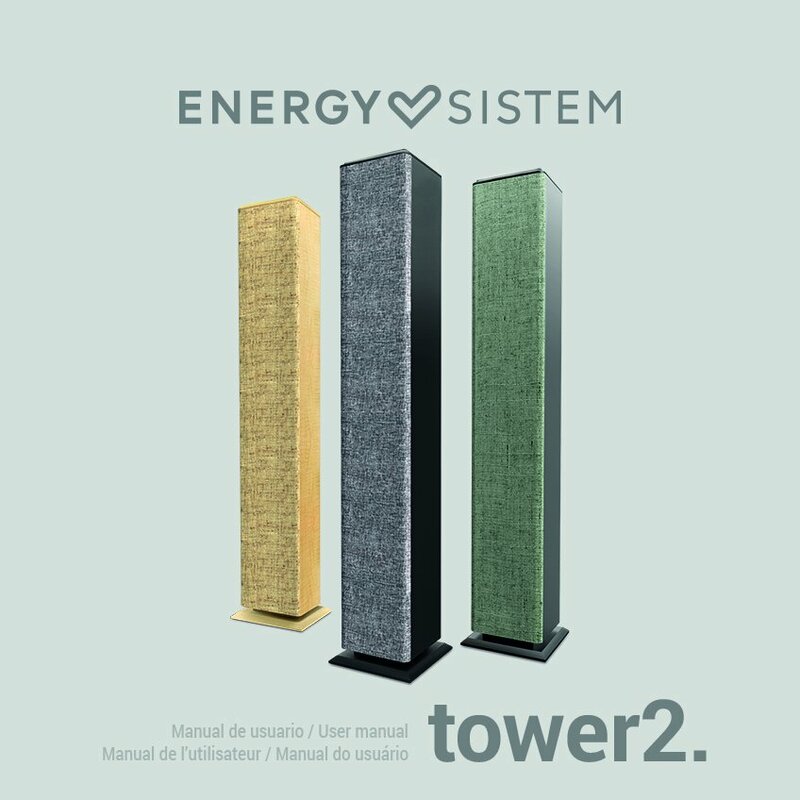 Bluetooth: Pair your devices wirelessly within a distance range of 30 m. To do this, enable Bluetooth on your source device and connect it to your "Energy Tower 2 Style". You will hear a confirmation sound to let you know that both devices have been paired correctly. Removable storage units (microSD cards/ USB sticks): it plays MP3 and WAV files from removable USB sticks and microSD cards of up to 128 GB. Press the Playback mode button (4) for 2 seconds to switch from one folder to another. Press the Repeat mode button (7) to choose one of the repeat modes available. You will hear a voice telling you which mode you've selected ("Random", "Repeat all" and "Repeat one"). Analogue input (AUX): your device features an analogue stereo input to connect external devices. This input has been conceived for a 3.5 mm jack connector. The cable is provided with the product. FM radio: once you have selected the FM radio function, press and hold the Playback mode button (4) for 2 seconds to carry out an automatic search of all radio stations available. Press and hold Next (3) or Back (2) to select the radio station that you prefer. Energy Sistem Technology, S.A. is liable for any lack of conformity that exists at the time the goods are purchased during a period of 36 months. This warranty covers any defects in workmanship or materials and does not cover any product failure due to accidents, misuse or alteration made by an unauthorized person. The special 36 month warranty is valid for the European Union. For other countries please refer to your specific legislation or your local distributor.